I've hardly ever had leftovers I didn't love. Mind you they turn into a whole new meal. That's what's so appealing and handy to have. The idea of just reheating and eating can be boring. Even if you have one portion left, it can definitely be used in another lunch or dinner. I regularly have "clean out my fridge" soups, which are never the same. Beef and chicken stews are hearty and flavourful, a good base for this easy dish. ■ Preheat oven to 350F degrees. ■ Shred leftover beef or chicken from stew and dice any vegetables into small pieces. ■ In a 9×13 baking dish, spread 3 tablespoons enchilada sauce evenly, covering bottom of the dish. ■ Spread 6 corn tortillas evenly, covering the bottom of the casserole dish. ■ Spread 1/2 the stew mixture evenly on top of the tortillas and top with shredded cheese. ■ Add another layer of tortillas followed by the last 1/2 of the stew mixture and top with shredded cheese. 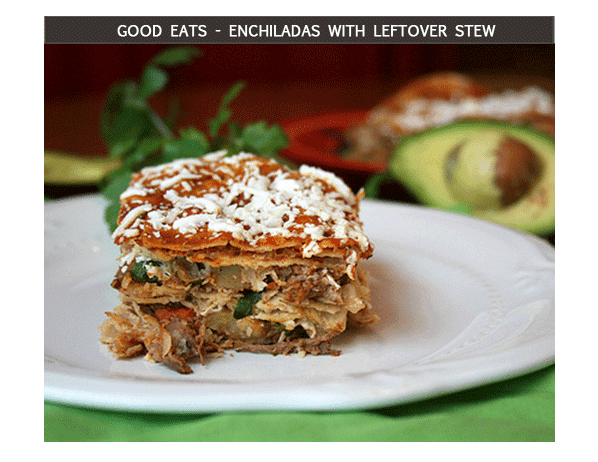 ■ Add a final layer of tortillas and top with enchilada sauce to cover. ■ Top with shredded cheese and bake for 20 minutes or until bubbling hot. ■ Serve topped with sour cream and diced avocados. ■ Heat oil in a skillet over medium-high heat. Stir in flour and chili powder, reduce heat to medium, and cook until lightly brown, stirring constantly to prevent burning flour. ■ Gradually stir in tomato sauce, water, cumin, garlic powder, and onion salt into the flour and chili powder until smooth, and continue cooking over medium heat approximately 10 minutes, or until thickened slightly. Season to taste with salt.